As a 7-year-old, Cayden already has very discriminating tastes. For his wish, he did something that car enthusiasts of all ages can only dream of. Kids Wish Network, a children’s charity that grants wishes for kids with life-threatening illnesses, sent Cayden to McLaren Chicago… his ultimate extravagant playground. Cayden and his family arrived at McLaren Chicago’s luxury showroom. He felt like a VIP getting a private tour and sitting behind the wheel of high-end sports cars. The dealership gave him a personalized backpack filled with merchandise, and a McLaren jacket that staff wear – he was joyful feeling like a part of the esteemed team. 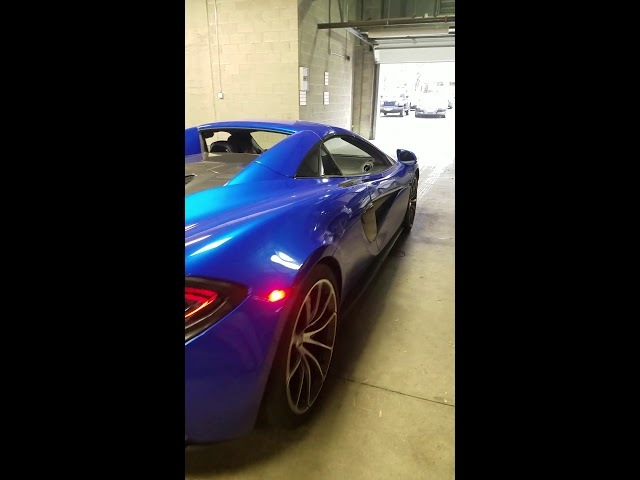 He also took a thrilling joy ride in a luxurious McLaren 570S on the way to an exclusive location housing their private collection of over 200 cars, motorcycles and race cars. The family spent hours seeing all the vehicles, and Cayden also talked shop with a McLaren mechanic who showed him all their special tools. Cayden was surprised to receive a license plate holder, an authentic McLaren emblem from one of their cars and a mini die cast in a display case. The General Manager’s generosity continued when he graciously offered a future visit. Another highlight for Cayden was attending the Muscle Car and Corvette Nationals. He saw a variety of treasured collector’s cars, and was gifted a Mustang die cast model as a special memento. His family also experienced holiday magic at Chicago’s annual Magnificent Mile Lights Festival. During the wish, Cayden’s family enjoyed beautiful accommodations at the Residence Inn Chicago Downtown River North, who surprised him with gifts and a welcome message on their hotel window. The family had memorable dining experiences at House of Blues, Bubba Gump Shrimp Co. and Food Life Café. They also received gift cards to Jimmy Buffet’s Margaritaville, Joe’s Seafood Prime Steak & Stone Crab, and Wildfire restaurants. Cayden deals with daily stresses from his autoimmune condition, and was so appreciative of all the kindness he received during his amazing wish. “It was an absolute wonderful weekend that we’ll always remember,” said his mom Amy.